Herod Agrippa II [b. 27/28 AD?-d. 93 AD?] became the eighth and final ruler from the Herodian family. Berenice [b. 28-after 81 AD], who first married Marcus Julius Alexander, son of Alexander the Alabarch around 41 AD. After Marcus Julius died, she married her uncle Herod, king of Chalcis. 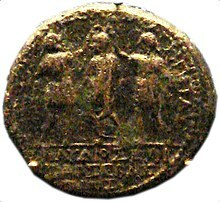 She later lived with her brother Agrippa II, reputedly in an incestuous relationship. Finally, she married Polamo, king of Cilicia as alluded to by Juvenal. Berenice also had a relationship with the Roman emperor Titus. One or more of the preceding sentences incorporates text from a publication now in the public domain: Chisholm, Hugh, ed. (1911). "Agrippa, Herod, I." . Encyclopædia Britannica. 1 (11th ed.). Cambridge University Press. p. 425.